No matter how hard you try to keep your WordPress website perfect, you are probably already aware of the fact that it is simply not possible. While you keep posting new content, publishing new pages and changing the structure of your site, problems will arise. Without exceptions. But don’t worry about that! It wasn’t your task to make a perfect website after all, but to do an excellent job while managing one. Today, let’s put all the other errors and problems to aside, and focus on one of the most common issues that regular Internet users come across while browsing. Even those who have no experience in web technologies know about 404 error pages. You’ve seen a few of those throughout your online life, haven’t you? But, while it is easy to render such an error message, a bit more challenging task is to customize this error page and make it more user-friendly. What are 404 error pages? What makes a good error page in WordPress? 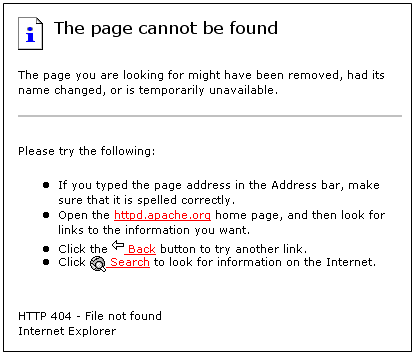 When a particular page cannot be found on your site, the server will display a 404 error message in the browser. It only means that the page or post aren not on that website (anymore). Usually, this happens when a user mistypes a URL to your site or when you delete a post that’s already indexed by search engines and linked from other sources. For example, if you have a contact page at www.yoursite.com/contact and someone tries to land on www.yoursite.com/contacts, WordPress would make a redirection to a 404.php page. If you decide to read more about 404 error pages, there’s a chance you will end up finding a myth about the nomenclature of this error. At one time, it was believed that the error got its name after a room at CERN where the original web servers were located. The truth is somewhat different. All HTTP status codes were actually established by the World Wide Web Consortium and have nothing to do with rooms nor buildings. By default, every WordPress theme comes with a 404.php template which is responsible for displaying the error message to unlucky readers. Unfortunately, those default pages are quite generic and contain only the basic information. So, if a user lands on your 404.php page, WordPress will just let him know that the resource requested could not be found on your server. As you can see from the screenshot, the message with Twenty Seventeen theme isn’t very personal. You just have to change that, don’t you think? 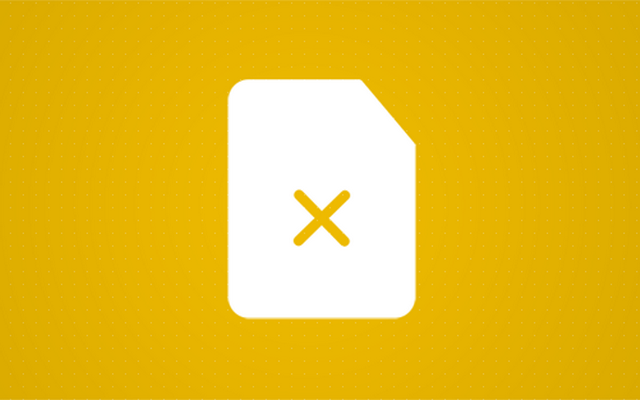 If you’re lucky, a theme that you are using already comes with a few 404 error page templates. Maybe it will even let you customize the page through a user-friendly interface. But if that’s not the case, don’t worry. We will now show you how to create a page on your own and keep the readers in the loop. Obviously, the elements of the page will depend on the site. Sometimes a funny picture just can’t be part of serious business sites, and sometimes you will work on websites that will have no blog posts at all. But take the best out of the list and think twice before putting elements on the page. We have come across some amazing custom error pages that can help you get the ideas. Usually, it is a good idea to make your 404-page fun. Since you already have to acknowledge a blunder, your visitors will like to see something amusing on the page. For starters, we would like to remind that modifying files of your theme is not the best practice. Before you start making changes, we’d like to suggest using a child theme. When you create a child theme for your site, all modifications to its files won’t be affected by updates that you will do to your regular theme. In this case, creating a 404.php file in the child theme wouldn’t have an impact on the original one, but it would still show to your visitors. Don’t get us wrong; there won’t be any differences if you modify the original file. But in that case, be sure to create a backup of it so that you can restore changes after an update. You have successfully created a custom template. If you preview the page, all you would see is an image, message and your standard header, sidebar, and footer that you have on all the other pages. Still, this is far from what we described earlier as there are no widgets, so stick with us for a few more moments until we create that perfect 404.php that you want. Also, it would be nice to add some styles to the page. While it is possible to code the entire page from scratch, there’s no need for that. WordPress already allows you to add widgets that will help you display the most recent and popular articles. As from version 4.8, you can even add multimedia in specialized widgets, so why not take advantage of that? After telling WordPress where to display the new widget area, it is time to actually add the widgets. So, navigate to Appearance -> Widgets, choose Recent Posts, Popular Posts or any other widget that you would like to have on your new 404 page (another example is the free Google Maps Widget to show your location). Don’t forget to customize the widgets to your likings, and remember that there are new multimedia widgets if you want to add images, videos or audio files to the page. If you followed all the steps, congratulations – you have a custom 404 error page that will be loaded to any of the visitors who reach the unreachable pages. But even if creating a custom template isn’t that hard when you just have to copy and paste the code we provided, there will be many of you who would rather work in a user-friendly interface. In that case, we would like to show you a simple plugin that will create custom 404 pages for you. This premium plugin is as simple as it gets. 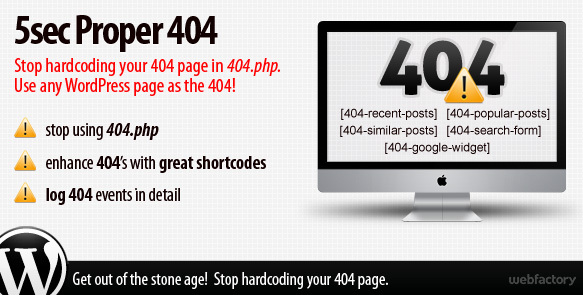 From the moment that you install it, you will be able to choose any regular WordPress page as your new 404 page. That means that you can simply add text, links, and multimedia just like with any other post or page and style it through an intuitive WordPress editor. 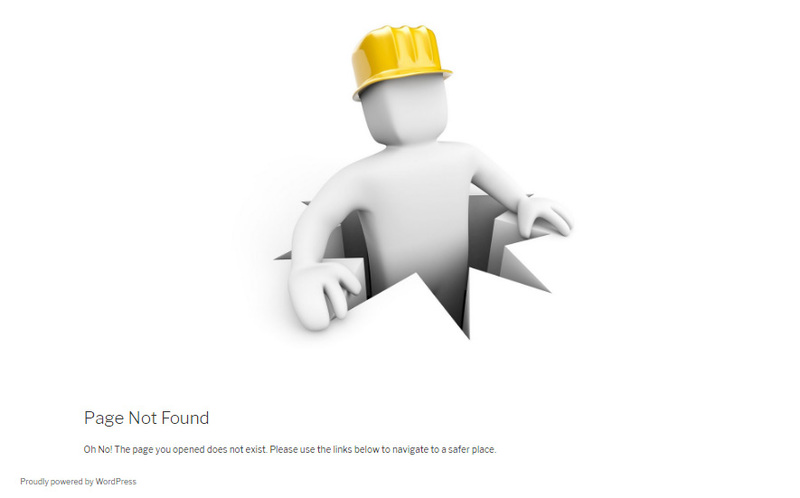 5sec Proper 404 will then let you mark that page as your new 404 page. And, basically, that’s all you have to do! By using the plugin, you can forget about the templates and the code we used throughout this article. After creating a page, the plugin lets you use five shortcodes (recent, popular, similar posts, search form and Google search widget). That means that you won’t have to worry about widgetized areas nor styling at all. While you are already taking care of broken pages, why not eliminate them completely? 5sec Proper 404 creates a detailed log which shows you all the broken pages that caused the 404 error message. While the visitors will see your new page, you can work from the backend, find links that aren’t working and fix them if possible. Now that we have shown you two different methods of customizing 404 pages in WordPress, it is your time to shine. Don’t let people land on those generic error pages that help no one. Personalize it with some code. Once you create a custom 404 page, don’t forget to leave a link to it in the comments below – we’d love to see your results!